Our mission is to help empower a community that is impacted by the needs for education and medicine in a remote region of the world. We want to help the community’s enduring culture by bringing education and care, and building renewable resources to promote sustainable development. Three things surprised us the first time we traveled to Joel’s village. First, we were amazed at how remote it was. The village is tucked between a series of hills on the northern shores of Lake Natron, a pink-hued body of water that straddles Kenya and Tanzania. The village is miles from a paved road, and the only way to access it is via a series of winding cow trails and sand-covered paths known only to locals. The two hour ride from Magadi, a slightly larger town on the shores of an eponymously named lake, is long, bumpy and dusty, and takes you past herds of cattle, children bathing in small streams that lead into Lake Natron, and the occasional giraffe. Once we arrived at Joel’s village, we were immediately struck by its isolation, and by the sheer lack of services available to the community. The town is comprised of a series of bomas — circular enclosures built with thorns, sticks and twigs — that are designed to keep livestock in and lions and other predators out. But aside from the bomas, the people of the village had little. The school consisted of a small structure, also built from sticks, that was far too small to hold the 12-plus children who resided in the town (since our project began in July 2016, the school grew in number to 72 kids). The school lacked benches or chairs, and the students used twigs and rocks to practice handwriting and arithmetic. Villagers often had to trudge to nearby streams to retrieve drinking water, which was a scarce commodity in the town. 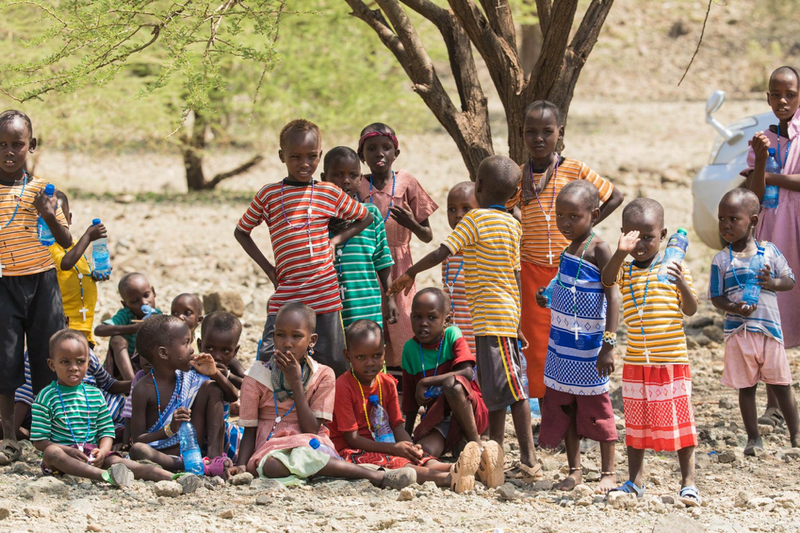 In fact, as we traveled through the bush from Magadi to Joel’s village, we stopped to hand out bottles of water to young boys herding goats who had called out “Enkare” (water in the Masai language) as we drove. The third thing about Joel’s village that amazed us was the resilience of the local population. While we griped about the beating sun and sought shade wherever we could, the villagers gave no indication that the heat bothered them. And though they had little to eat and even less to drink, the villagers never complained or showed any signs of discontent. To the contrary, the people who lived in Joel’s village were always smiling, laughing and singing, exuding a type of happiness that few of us had ever seen before. The enthusiasm and grit exhibited by the residents of Joel’s village inspired us, and as we drove back to Magadi and Nairobi, we decided we would help the village in any way that we could. Thus far, we’ve raised enough money to construct a building that serves as both a school and a church for the population, and to install a water system that can help to address water shortages in the town. 8. Expanding the school so it becomes a regional training facility for young people who want to become educators.